G.O.Ms.No.126, Dated 11th April 2018. PENSION – Dearness Allowance to the Pensioners and Family Pensioners – Revised rate admissible from 1st January 2018 – Orders – Issued. 1. G.O.Ms.No.313, Finance (Pay Cell) Department, dated: 25-10-2017. 2. From the Government of India, Ministry of Personnel, Public Grievances and Pensions, Department of Pension and Pensioners’ Welfare, New Delhi Office Memorandum No.42/06/2018-P&PW (G),dated 22-03-2018. 3. G.O.Ms.No.123, Finance (Allowances) Department, dated:11-04-2018. 2. Government of India, in its Office Memorandum second read above has enhanced the Dearness Allowance payable to its Pensioners / Family Pensioners from the existing rate of 5% to 7% with effect from 1st January 2018. 3. In the Government order third read above, orders were issued revising the Dearness Allowance payable to State Government employees and teachers from the existing rate of 5% to 7% with effect from 1st January 2018, following the Government of India’s decision on enhancing the Dearness Allowance to its employees. 5. The additional installment of Dearness Allowance payable under these orders shall be paid in cash with effect from 1-1-2018. 6. The arrears of Dearness Allowance for the months of January, February and March 2018 shall be drawn and paid by existing cashless mode of Electronic Clearance System (ECS). While working out the revised Dearness Allowance, fraction of a rupee shall be rounded off to next higher rupee if such fraction is 50 paise and above and shall be ignored if it is less than 50 paise. “2071. Pension and Other Retirement Benefits – 01. Civil – 105. Family Pensions – State’s Expenditure – AC. 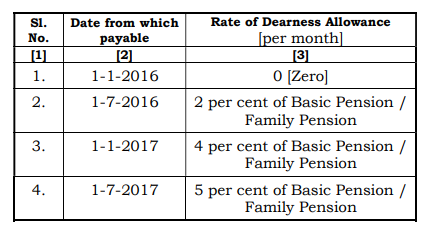 Dearness Allowance to Family Pensioners of Tamil Nadu Government – 03. Dearness Allowance (D.P.C. 2071 01 105 AC 0308) “.